The auto maker concedes the SUV&#8217;s off-road capabilities fall short of the &#8217;11 Jeep Grand Cherokee but says customer workshops reveal Explorer owners rarely take their vehicles off-roading. SAN DIEGO – Ford Motor Co. has launched numerous new vehicles over the last several years, but few have been as important as the ’11 Explorer SUV, a top marketing manager says. “When you ask customers about the Ford brand, they mention three nameplates – F-Series, Mustang and Explorer,” Amy Marentic, Ford group marketing manager-cars and CUVs, tells Ward’s at a media event here. 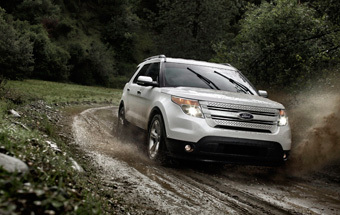 “Having a healthy Explorer is absolutely crucial to having a healthy Ford brand,” she says. Marentic and her team got an early jump on marketing the new Explorer, scheduled to arrive in dealerships in the coming weeks, due to the vast differences between the new and outgoing model. Early initiatives included a multi-state television introduction by key Ford executives in July and the establishment of a dedicated Explorer Facebook page. Two of the biggest differences are the lack of a V-8 – the new Explorer will launch with a 3.5L V-6, while a 2.0L direct-injection turbocharged inline 4-cyl. will be added next year – and the fact the vehicle is based on a car platform rather than a truck. Some past Explorer owners question Ford’s decision, Marentic says, noting they also want to know why a V-8 is not being offered. To address such issues, Ford’s marketing team has created a number of short online videos, some featuring celebrities such as rocker Bret Michaels. The switch to a car platform was done for fuel-economy reasons, she says. It was important that the change not negatively affect the Explorer’s off-road capability, something the model long has been known for. Ford concedes the Explorer’s off-road capabilities fall short of the recently launched ’11 Jeep Grand Cherokee, but says customer workshops reveal Explorer owners rarely, if ever, take their vehicles off-roading. According to Ford research, 83% of Explorer customers drive on established roads all of the time, with just 17% who wander off the pavement. Despite those numbers, “When they are off road, we need to ensure we’re taking care of them,” Marentic says. To make off-roading easier, Ford developed a new terrain-management system that allows drivers to turn a console-mounted knob to the proper mode: snow, sand, mud or normal. Marentic says the old system, in which drivers had to choose between 4-wheel-drive low and high settings, proved confusing. She recalls asking an Explorer owner how often she used the 4WD low setting. Ford also leveraged consumer workshops to determine what, and how often, Explorer owners tow. The results indicated the Explorer’s 5,000-lbs. (2,268-kg) tow rating was sufficient for the vast majority of owners. Although the Explorer is not yet on the market, it already has surpassed Ford’s expectations, amassing some 15,000 pre-orders, about three times what the auto maker had predicted. That surpasses other much-hyped Ford vehicles, such as the Fiesta and Taurus, Marentic says. The auto maker has high hopes the new Explorer will appeal to former owners, of which about 140,000 turn in their older models to Ford dealers each year. Because of the Explorer’s off-road and towing capability, as well as seating for seven, the auto maker expects the new SUV to attract a different customer than those who purchase its lineup of cross/utility vehicles, including the Ford Flex and Edge. Marentic says she expects customers to cross-shop the Explorer with the Jeep Grand Cherokee, Honda Pilot, GMC Acadia, Toyota Highlander and Chevrolet Traverse. She’s mum on volume expectations, but expects the new Explorer to outperform the current model. U.S. Explorer sales were up 11.0% through November, compared with year-ago, to 50,588 units, according to Ward’s data. That’s a far cry from the vehicle’s heyday, when it reigned as the best-selling SUV in the U.S. Its best year was in 2000, when Ford delivered 445,157 units. The ’11 Explorer, built at Ford’s Chicago assembly plant, will start at $28,995 for the base-level, $31,995 for the XLT trim level and $37,995 for the top-of-the-line Limited. Prices include an $805 delivery charge.